You're ready to hit the weights and replace that extra inch of flab with solid muscle, so you're looking for weightlifting programs for beginners. However, what is the best approach to make sure you get started on the right foot? Here is a detailed, step-by-step program for fast results. A well-balanced program works each muscle group several times per week with adequate rest periods in between. Additionally, you should also try to work in a couple cardiovascular workouts for overall health, such as swimming, running, tennis or any activity you enjoy. As a beginner, work each muscle group twice a week. Try this program. Sets = number of times you do a particular exercise. Reps = number of repetitions within a set. 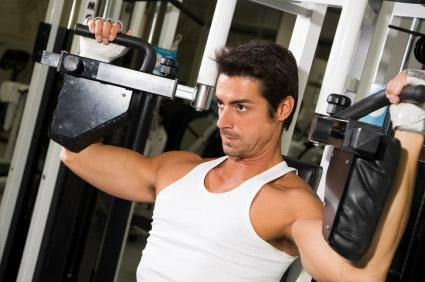 Doing two sets of 10-12 reps of bench presses would mean you lie down on the bench, do 10-12 presses, rack the weights and rest for a minute, then lie back down and do another 10-12 presses. The number of reps indicates the upper limit of how many you can do on your own without cheating. In other words, 10-12 reps mean you should pick a weight heavy enough that you do just about 10 reps, and then squeeze out another one or two by pushing yourself hard. If you can do 12 reps and feel you have enough juice for a couple more, add more weight for your next set. When starting any exercise program, take the following precautions. Before you start, make sure you're up to it. The point is to get in better shape, not aggravate an old injury or start out so hard that you overtrain. Check with your doctor if there's any particular exercises to avoid, appropriate intensity and so on. No weightlifting should take place before you've had a thorough warm-up. Spending 10 minutes at medium setting on a treadmill will elevate your body temperature, lubricate your joints, and generally decrease the risk of sprains and more serious injuries. All weightlifting programs for beginners should come with five to 10 minutes of cool down and stretching at the end. The cool down and stretching will increase flexibility and decreases the amount of soreness the next day. It is always a good idea to consult with a professional trainer to make sure you have good form. It's much more productive to use less weight and do the exercises right, than use more weight and cheat. This routine is just one example of many possible weightlifting programs for beginners. As you become more experienced, you'll no doubt want to substitute exercises and perhaps try new routines altogether. This is a very good thing, as your progress benefits greatly from variation. Be aware that many exercises have more than one name. For example, pull-ups frequently go by the name chins, French presses sometimes go by the names of skull crushers, and so forth. Don't be confused if you look up specific exercises online and find them called different things. Finally, it bears repeating that working with a professional trainer is a great way to ensure that you have the form down pat and avoid wasted effort and/or injuries down the road.